"Go back to Iraq," a man shouted while driving past about 120 protesters at the Vandenberg Air Force Base main gate on Saturday. "We're not from Iraq," said one protester at the peace rally organized to speak out against the proposed United States space missile defense program and war in general. Protesters gathered at the base and Ryon Park to raise awareness about peace. Saturday was also Armed Forces Day - a day meant to honor those in the military. 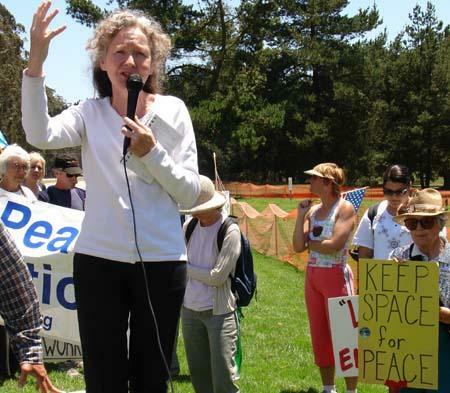 The main speaker at the event, peace activist Kathy Kelly, denounced the war in Iraq. "I have never seen anything that would justify a terrorist act," Kelly said at the peace rally. "But I would say when we ask what other countries hold as grievances, people don't want to be under occupation, they don't want to be invaded, and they don't want to let their children starve." Protesters held up signs that read "All War is a Crime Against Humanity" and "No WMDs in Space." Protester Wayne Eppley, of Lompoc, said the goal of the rally was to encourage other people to think about United States' foreign policy. "It's flawed because we're acting as if we had the right to invade any other county through military means as a first resort or primary tool for forcing world outcomes which we believe is in our interest," Eppley said. "This sets a precedent for the rest of the world that any country can invade another country." Guy McCullough, another protester from Lompoc, said it is in the best interest of the country to support international law. "The people who are leading this war on terror seem to be acting as if these laws and our constitution are vulnerabilities that our enemies can exploit," he said. "I think these rights are our strengths and the best way to earn influence in other parts of the world." Bruce Melton, a retired Navy veteran from Santa Ynez, held up a sign across the street from the protesters that thanked the military for their service. "The protesters protesting against the armed services on Armed Services Day is equal to protesters protesting against mothers on Mother's Day," Melton said. Captain Todd Fleming, of Vandenberg Air Force Base, said a peace rally involving protesters happens at least twice a year. "We respect the right to protest here at the base while at the same time, we ensure we're protecting the resources and security of the base," Fleming said while base personnel were snapping photos of the protesters for security purposes. Many of the activists from the base regrouped at Ryon Park at 3 p.m. later on Saturday where Kelly also spoke. "Putting weapons in space is going to engender a new arms race among other countries. We're spending hundreds of millions of dollars on that while 30,000 people a day die of starvation and 400,000 children in Iraq suffer from acute malnutrition," Kelly said at Ryon Park. Peace activist Dennis Apel said the rallies at the base and at Ryon Park were important because "we live in a democracy and if we don't exercise our democracy than we'll lose it." Staff writer Neil Nisperos can be reached at 736-2313, ext. 108, or by e-mail at nnisperos@pulitizer.net.